This site is a visual experience. Please update your browser to explore SS 17. As we are facing a new season of global adventure, Fjällräven is proud to have a line-up of clothing and equipment that is just as functional as it is conscious. Spring and Summer 2017 is about exploring warmer latitudes and making nature the next big priority when choosing gear. Fjällräven has focused on making warm-weather trekking and travelling smarter, lighter, more comfortable and sustainable than ever. From being constantly on the move, we are familiar with intense activities at both ends of the thermometer. Summer is the time to explore new horizons, and we are determined your gear won’t slow you down. Regardless of your destination we want your journey to be as smooth as possible. Discovering more means experiencing new challenges and different conditions. We adapt to everything that nature brings us. To fully enjoy and cherish it. Fjällräven’s new fabric G-1000 Air has arrived and it’s designed to be worn on intensive summer hikes. Products made in G-1000 Air are designed for heat, sun and other variables that come with new adventures. It is a lighter and airier fabric that, in contrast to the original fabric, has not been treated with Greenland Wax – making it highly ventilating. It is made from recycled polyester and organic cotton. This is a pair of trekking trousers in compressed format. A hybrid born from our experience of making trousers and demands for comfort and freedom of movement. The stretch fabric is durable, and the reinforcements over the knees and rear resist hard wear while being flexible and breathable. Zippered pocket in the waistband for keys and other small but important items. Gusset at the crotch and low-profile flatlock seams minimize the risk of chafing. Large leg pocket keeps a map at the ready. In Sweden we have something we call Allemansrätten. Everyone has the right to visit almost anywhere at any time, camp for a night and roam freely in nature. With this great freedom comes great responsibility, and we are always careful to leave nature the way we found it. Or in even better shape. All our products are made to make the time you spend in nature as enjoyable as possible. Garments made for spontaneous outdoor adventures. 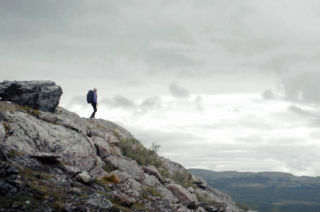 Every year our backpacks are put to the test on our yearly trekking adventure Fjällräven Classic in Abisko. This year we’re introducing Classic treks to Hong Kong, USA and Denmark. This gives us more inspiration for making the next generation of backpacks, engineered for functionality and even lower impact on the environment. We research the principles of carrying, make new developments and think innovatively. We create carrying systems that distribute weight well, that ventilate better, and that are easy to adjust to different users’ backs. We re-examine packing compartments to make it even easier to pack and keep an eye on your gear. We always make our products with as little environmental impact as possible. Kajka is a durable and comfortable backpack for advanced trekking. It’s engineered for heavy loads and it can easily be adjusted to fit different body types. We’ll bring it to the Original Fjällräven Classic in Abisko, the very heart and soul of Fjällräven. Abisko is a simplified and comfortable backpack for trekkers who like to move about without too much weight. A backpack for treks like Fjällräven Classic Denmark, a trek that’ll take you through charming villages, ancient forests and colourful farmland. Abisko Friluft is a backpack that’ll provide great cross-flow ventilation and superb carrying comfort in hot and humid conditions. Suitable for treks like the tropical Fjällräven Classic Hong Kong. Kaipak is a simple and hardwearing trekking backpack in G-1000 HeavyDuty Eco. A reliable companion on treks like the Fjällräven Classic USA, a more challenging adventure than ever before.